Thanks to everyone who made our book launch a great success! A big ‘Thank-you’ to Leslie Wallack of The Book Nook for sponsoring the event and for the warm hospitality of Leslie and her staff. A special thank-you to some folks who travelled from a distance the day after a heavy snow-storm – Tracy Mackintosh and Art Storring who came all the way from Athens, Ontario and Fran and Bower Mulligan from Chesterville, Ontario. It was a great pleasure to see the President of the Lanark County Genealogical Society Janet Dowdall who took the time to stop by and offer her support and her husband Brian one of the many who were among the first to purchase ‘Lanark County Chronicle’. Many thanks also to some of my former neighbours from the Third Line – Janice Gordon, Elaine Morrow from DeWitt’s Corners, Shirley Myer’s family, one of the McParlan girls from past Glen Tay and many others. Thanks also to those former high school friends who popped by like Fern Bennett Milner and Dan Milner and to some new friends as well who took the time to stop by and chat about the good old days. A special thank-you to my niece Meaghan Ryan who set up the feature table so nicely and to her fiance Sean Christie who helped us as well and who brought us tea and treats from the nearby Sunflower bakery on Gore Street. 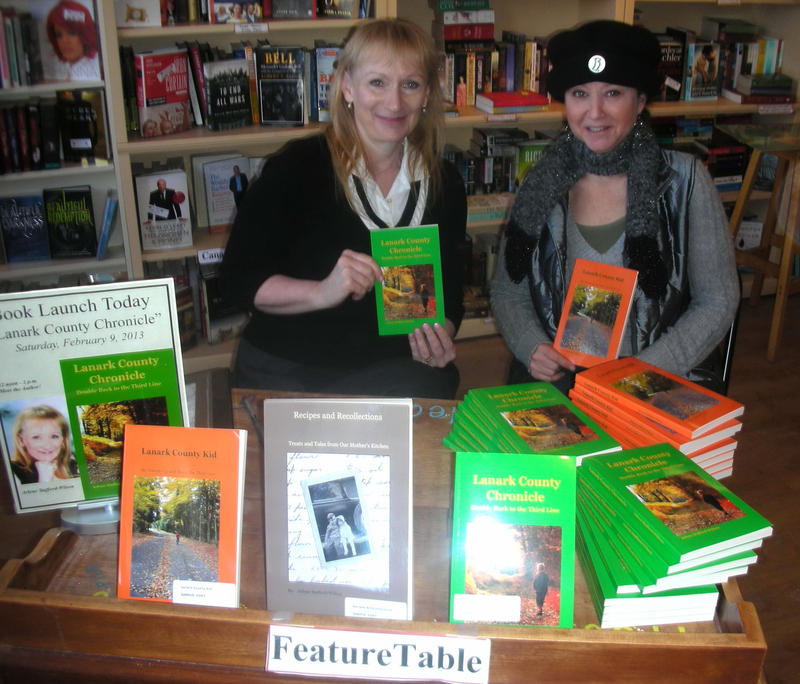 Thank-you to the many others who stopped by the table to chat and for all who purchased not only the new book ‘Lanark County Chronicle’, but who picked up copies of the first two books as well and kept Leslie and her staff busy all afternoon. I wish we could have had a chance to speak with all of the folks who came by to visit but the line-ups at the feature table were long at times and we stayed almost an extra hour past our time in order to chat with as many as possible. Thanks again for helping to make our day such a great success! This entry was posted in Author Events & Book Signings and tagged Arlene Stafford-Wilson, lanark county book launch, Lanark County Chronicle, Perth Ontario, The Book Nook.